For the first time ever you can upgrade from your existing copy of Pro Tools to Avid's flagship DAW software Pro Tools Ultimate (previously HD). 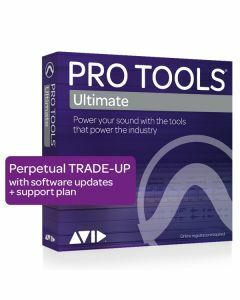 To take advantage of this upgrade you must own a Pro Tools 11 or higher perpetual license which you will surrender for a copy of Pro Tools Ultimate as well as an annual Upgrade and Support Plan giving you access to the latest Pro Tools Ultimate releases, 25 bonus plug-ins and priority support direct from Avid - renewable yearly. â€¨From numerous new MIDI editing enhancements and retrospective MIDI recording, to the ability to save your favorite effects chains and instrument sounds as track presets, Pro Tools | Ultimate 2018 (formerly Pro Tools | HD) enables you to keep your creativity flowing. â€¨Kick time-consuming tasks to the curb. With Track Presets, you can quickly save, catalog, and recall your favorite effects chains, vocal processing, session import criteria, and other track settings—boosting your efficiency—so you can spend more time creating.